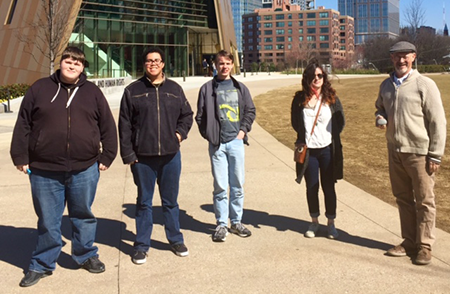 On Thursday, the 25th of February, Cowley College’s Academic Excellence Challenge team team left bright and early and drove to Atlanta, Georgia to attend the National Academic Quiz Tournament. Cowley's A-team included sophomore Amy Austin, freshmen Harvey Baker, Daltin Brock, and Garrett Misora. They enjoyed tough competition, playing a total of 13 rounds. The most memorable game happened in the fifth round when they played Gulf Coast, a community college from Panama City, Florida. Later that evening, Cowley learned that the Gulf Coast team had the top ranked individual player of the entire tournament, Joey MacIsaac. At the end of the tournament on Saturday, Cowley was tied for 19th place out of 24 teams competing and 61 teams nationwide. The AEC team enjoyed a beautiful afternoon when they were able to tour the Center for Civil and Human Rights Museum as shown in the photo. Those pictured are, from left, Daltin Brock, Harvey Baker, Garrett Misora, Amy Austin and Mark Flickinger.